See, Green can kill stuff, as long as it’s creature related. Of course, it can’t just kill creatures, but that’s what the deathtouch is for. When is this a combat trick? When you’re playing against Uril. Better than Tranquility. One of the best 1-drops ever. Put it in any Green deck ’cause it will make any color. If you don’t have one, get one, they’re way cheap now. Yeah, a Grey Ogre is nothing to write about, but this one, when sacrificed, will gain 4 life. So, why are you reading about it? I’m going to say it’s better in this format than the rare in M11 that will gain 4 life when it enters play. Before combat rules were changed, you could swing, deal damage, sac and gain 4 life while (hopefully) kill a creature. But the fact that this can be played with a good number of Black cards, while gaining life, is going to be the key. No, it’s not Ravenous Baloth, but then again, this is a boar. Kodama’s Reach saw print 6 years ago. According to Magic, I’m really old. So, there’s a good chance you might not have played this card. If you haven’t do try it out. It’s a huge argument for throwing more basic lands into your deck. If you think 6 years is a long time in Magic, double that. 12 years since Survival of the Fittest was printed. The differences are stark: Fauna Shaman’s a creature and easier to kill, has summoning sickness and can only be used once a turn. Does that mean it’s not going to be a good card? No, it’ll still be an amazing creature that needs to be killed before it gets out of control. Building a toolbox deck will be even easier once you have two Survivals on the table. Graveyard based decks will love this as well as finding that creature right when you want it. I do think that the funniest thing would be to Survival for your Fauna Shaman. See, you can Fauna Shaman this guy. What might be the best reanimation target in the set, the only thing it’s missing is trample, but you can add that on later with Behemoth Sledge. He shakes off more bounce and removal (remember, if it still has Green in the casting cost, it’s still green), but he can be chump blocked and killed with enough small creatures getting in its way. More often then not, you’ll have at least one other player in Green as well, so do what Arnold did and tell him you’ll kill him last. The only one of the original five Planeswalkers that I actively try to put in my EDH decks where I haven’t picked out a theme yet. The untapping ability is nice, the beast is nice and every so often I might Overrun. The best, of the best of the best, sir. Because he mixes with Garruk so nicely you might think he’s an auto include as well. Green doe have a number of cards that do make larger creature tokens with 3+ power. With Rampaging Baloths, you play a land, get a 4/4 beast, and draw a card. Seems pretty saucy to me. Again, depends if you can abuse him, but does seem pretty fair. If Rofellos, Llanowar Emissary, was still legal I’d say It might be an auto include. Now? It’s kinda just a novelty. All hail Squishface. Cute, fun and annoying all into one card. You just can’t kill it with fire, you have to go the full way and just keep getting rid of it. Great for sacrifice fodder. The yang to Call to Mind‘s ying. Regrowth is better, Eternal Witness is better, but this is more fitting for Green flavorfully. If you’ve got Green bounce or you play with Blue, then of course this will be the better call to Brindle Boar. But don’t trick yourself holding it in your hand waiting for an opponent to make you discard it. And unless you have a player in your play group who does that all the time, this will sit in there doing nothing. Don’t be that guy. And now, to the best Titan. Again, it’s not just the mana ramping that I’m excited about, it’s the fact that he goes to get ANY land. AND he puts it in play. If it were basic lands, a collective sigh would be coming from the Magic community and this guy wouldn’t be as talked about. But you can go get man lands, fetch lands, pain lands, and trigger landfall twice. For 6 mana you get any two lands you want and put them into play; oh, you also get a 6/6 Trampler. The Titans are designed for you to attack with, to help with the benefits. Being up 4 lands over an opponent in the mind range of the game will provide with better results and most likely a win. Does not replace Sakura-Tribe Elder since she doesn’t put the land into play. It’s a better Borderland Ranger since it can come down a turn earlier, but don’t get those two confused. Still a good enough card if you got enough basics to go along with it. That’s Green; a whole lot of creatures and mana ramping. In Core Sets you’re going to get the usual “this is what the color can do” type of cards. Some are more exciting (Primeval Titan) while some are kinda boring (Prized Unicorn). Let’s hear your thoughts below. 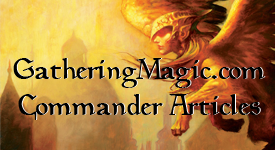 This entry was posted on Thursday, July 15th, 2010 at 4:21 pm	and posted in EDH, M11, Magic: the Gathering, Really Big EDH Review. You can follow any responses to this entry through the RSS 2.0 feed. Doubling Season is good with a lot of cards obviously, but looks kinda fun with Mitotic Slime, especially if you want to use it for sacrifice fodder. These articles are among my favorite type to read when a new set comes out, and the YouTube links pretty much put this one over the top for me! Thanks!